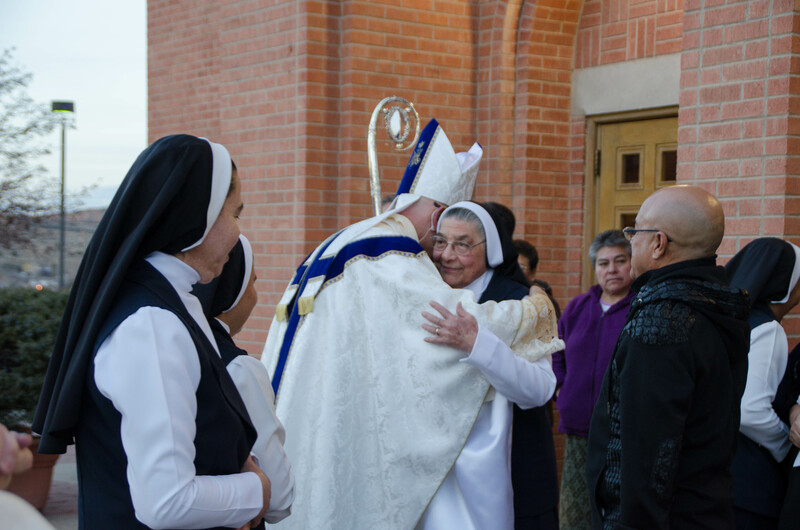 For 40 years, the Sisters of Our Lady of Guadalupe and St. Joseph have served the marginalized minorities of Gallup. At their intimate, dual-building complex, they open their door to whoever comes knocking. Most of their visitors speak Spanish as a first language, and have trouble navigating the demands of a new country. Others know the sisters as the teachers of their children, or come to look through a box of free clothing. 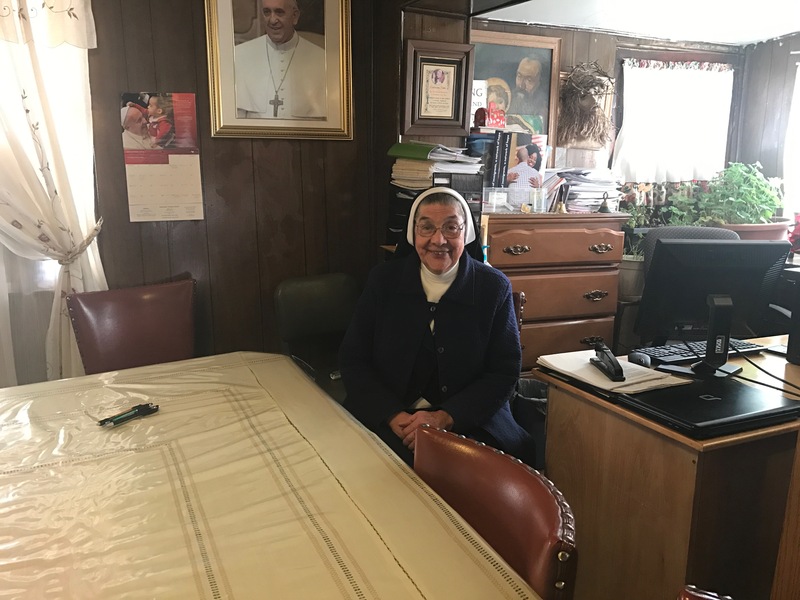 Mother Magda Garcia first came to the Diocese of Gallup in 1976 at the invitation of Bishop Jerome Hastrich. Two local schools, Gallup Catholic and St. Francis, were in danger of closing and needed teachers. Their efforts helped to save the schools, and eventually their ministry grew and evolved. Mother Magda, left, and one of her sisters in their small kitchen. They are the only community founded inside the Diocese of Gallup, established on December 12, 1976. 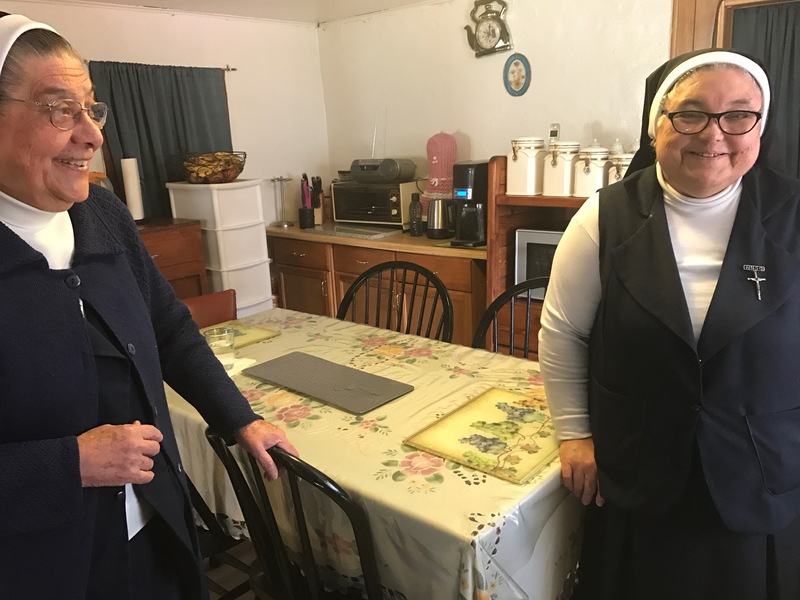 Mother Magda and three other sisters had a desire to form their own community, and Bishop Hastrich was the first to answer their letter, granting permission for them to establish a home in the Diocese. That home, on Gallup’s north side, has served as a base of operations for 40 years. One building, tight and cozy, contains the bedrooms where the sisters sleep and a larger room that is used as a living space, dining room, and office all in one. The second building holds a small chapel, where the Blessed Sacrament has been placed for perpetual adoration for decades. Mother Magda, in the room that serves as both an eating area and an office. Our interview was a little late, since I was not the first visitor to the house that morning. When I arrived, a young couple sat at the dining room table, trying to make sense of a large amount of paperwork in English. Mother Magda acted as both translator and agent, describing for them how the papers should be filled out. This is another component of the work the sisters do each day. Their time in the Diocese has not been without its share of obstacles, however. Until now, the sisters had only been a private association of the faithful, and not what is known as a “public association of the faithful within the Diocesan Rite” – that is, officially recognized by Rome as a public order within the Diocese. Often if women came expressing interest in joining the order, the lack of official recognition would discourage them. But there is a light at the end of the tunnel. On December 12th, a special 40th anniversary Mass was held at Sacred Heart Cathedral in honor of the sisters, and Bishop Wall formally signed the documents that will go to Rome, asking that the sisters be recognized as a public order. At the 40th anniversary Mass. Soon they will also have a new home. The building recently vacated as chancery headquarters was purchased by Dr. Raymond Ponce, a long-time benefactor of the Sisters from California. A construction team will undertake extension renovations to the old chancery and turn it into a proper convent, complete with a chapel and comfortable living quarters. For Mother Magda, the transition will be bittersweet. Their current home is well-known, and people have grown accustomed to visiting them on the north side of town. While the new convent will give them much more room for privacy and work, they will miss their old neighborhood.